Winners from the 2017 International Photographic Competition Revealed During Imaging USA in Nashville, Tennessee, Jan. 15, 2018. The Grand Imaging Award finalists have been judged to be the very best of the 2017 PPA International Photographic Competition (IPC). 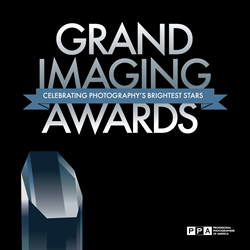 Professional Photographers of America (PPA) has announced its finalists for the Grand Imaging Awards, to be awarded at Imaging USA 2018, the largest annual conference and trade show for pro photographers. The Grand Imaging Award finalists have been judged to be the very best of the 2017 PPA International Photographic Competition (IPC). The Grand Imaging Award finalists were selected from 5,800 entries judged by a panel of 33 jurors. There are ten finalists in ten categories comprising the Grand Imaging Awards, and one winner from the ten categories will be named the recipient of the overall Grand Imaging Award. View slideshows of the finalists at PPMag.com/2018-gia-finalists. In the Children’s Portrait category: Brent Lewis, Cristie Reddehase, DiAnna Paulk, Felice Boucher, Kathy Wierda, Kathy Wierda, Kimberly Smith, Leslie Kitten, Louise Simone and Mariellen Youngdahl. In the Artist category: Ann Murfin, Cristie Reddehase (two albums), Maria Bernal, Michelle Parsley, Nylora-Joy Bruleigh, Peggy Sue Seehafer, Richard Sturdevant and Sandra Pearce. Each category winner will receive a crystal award and the winner of the overall Grand Imaging Award will receive a $1000 cash prize. Last year’s winner was Chicago pet photographer Barbara Breitsameter, M.Photog.Cr., CPP, for her image “Send in the Clowns” in the General Portrait category. Professional Photographers of America (PPA) is the largest international non-profit association created by professional photographers, for professional photographers. Almost as long-lived as photography itself, PPA's roots date back to 1869. It assists 30,000 photographers through protection, education and resources for their continued success. See how PPA helps photographers be more at PPA.com.